Looking for a New Toyota 86 in your area? CarGurus has 1,302 nationwide Toyota 86 dealers with 4,655 new car listings. When the Scion brand was dissolved a few years ago, parent company Toyota had the good sense to bring the FR-S rear-wheel-drive coupe into the fold. That car, now known as the Toyota 86, was introduced in 2017 and got a new trim level, the GT, for 2018. The 2019 model carries over unchanged except of for a new third trim, the TRD Special Edition. The Toyota 86 is low, lean, and likable, with an exterior that shows attitude but not arrogance. The new TRD Special Edition gets an edgier look thanks to exclusive front and rear bumpers, side sills, and spoiler, as well as a new 18-inch alloy wheel design, brushed stainless steel exhaust tips, Brembo brakes, and TRD graphics. A bright blue called Neptune joins the 86’s color palette, though the TRD Special Edition is available only in Raven. Powertrain options remain the same, even for the TRD Special Edition. The 86 features a 2.0-liter flat-4 engine rated for 205 horsepower and 156 pound-feet of torque. The standard transmission is a 6-speed manual, perfectly suited to make the most of the engine’s power. If you opt for the 6-speed automatic transmission with steering-wheel-mounted paddle shifters, horsepower drops to 200. These engine specs are modest for a sports car, but the 86 is still fun to drive, and the relatively low power translates to good fuel economy. The base configuration has EPA ratings of 21 mpg city, 28 highway, and 24 combined. With the automatic, numbers increase to 24 mpg city, 32 highway, and 27 combined. Though the Toyota 86 technically seats four passengers, the rear row is a tight squeeze for adults. All trim levels get a sport steering wheel with integrated controls. Up front, you’ll find cloth sport bucket seats in the base model and heated synthetic suede in the GT. The TRD Special Edition upgrades to red and black sport seats with red stitching and red seatbelts. It's also offered with heated leather seats. The GT and TRD Sport add push-button start, remote keyless entry, and a 4.2-inch driver information display. Every Toyota 86 model gets a 7.0-inch touchscreen display, an eight-speaker Pioneer audio system, Bluetooth, HD Radio, and iPod connectivity. Android Auto and Apple CarPlay are not available. Navigation is available as a dealer accessory. 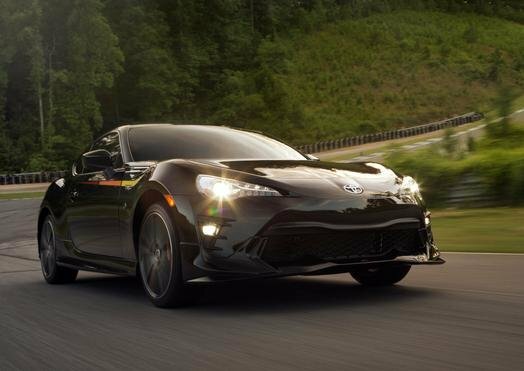 The 2019 Toyota 86 has not yet been evaluated by the Insurance Institute for Highway Safety (IIHS), but the 2018 model earned Good scores on its crash tests. A reversing camera is standard, but no other advanced safety features are available. If you’re looking for an affordable and easygoing rear-wheel-drive (RWD) sports car, there aren’t many choices. However, the Toyota 86’s success in this niche market is on its own merits, and not because of a lack of competition. The new TRD Special Edition adds appealing new options to this otherwise delightfully simple car. What's your take on the 2019 Toyota 86? niamarkanthony Looking for a Lexus SC300 or SC400, manual transmission, with less than 130,000 mint miles. Also a Subaru 2 door Coupe, maual trasmisson, nothing under a 1996 year. Or a Toyota Scion, manual transmission, year 2000 above, 2 door Coupe. All need to have a moonroof, manual transmission, and under 135,000 miles, and completely NO RUST!!!! Have you driven a 2019 Toyota 86? Enter your zip to see incentives for a new 86 in your area. CarGurus has 1,358 nationwide 86 listings starting at $14,997. Does Dealership Advertised Website Pricing Have To Be Honoured ?